From January 1 to July 31, 2017, at least 2,385 people drowned while attempting to cross the rough waters of the Mediterranean, according to the International Organization for Migration’s “Missing Migrants” project. If this trend continues, 2017 may well be the deadliest year yet for migrants seeking refuge and opportunity in Europe. In total, 2016 saw more than 350,000 successful crossings and 5,000 recorded deaths. Since 2014, these deaths have received unprecedented media attention, despite the fact that since 2000 more than 46,000 people have drowned or gone missing on the various Mediterranean routes. As a result of Europe’s current migration crisis, many states are grappling with the incompatibility of the legal limits on who can legally be classified as a refugee and the social reality of who is understood socially and culturally to be a refugee. The legal framework in which refugee decisions are made is based on the 1951 Geneva Convention Relating to the Status of Refugees. In order to be considered a refugee a person must fulfill three criteria. They must be outside their country of origin or nationality, they must have a well-founded fear of persecution in that country, and that fear must arise as a result of the categories that the Convention recognizes: race, ethnicity, religion, political opinion, or membership in a “particular social group.” World War II, the backdrop against which the legal definition of the refugee was first articulated, has had a lasting impact on the extent to which law is in line with social and political realities. The nature and scale of persecution witnessed during the Holocaust shocked the global moral conscience, but it also set a dangerously specific template that most of the world’s currently persecuted populations cannot mimic. One of refugee law’s challenges, then, is the persistence of these historical demands on migrants’ experiences despite myriad social, political, and economic changes to the causes and consequences of displacement. Art engages with and questions law’s boundaries by illuminating and appropriating the performative aspects of law, in particular its role in the creation of socially legitimated meaning. The waning relevance of the law, coupled with the reality of a contemporary refugee crisis, creates a space in which the idea of the refugee can and must be challenged. Art has emerged as one form of expression in which such a rearticulation is taking place. Art engages with and questions law’s boundaries by illuminating and appropriating the performative aspects of law, in particular its role in the creation of socially legitimated meaning. When law’s role is performed in an artistic space, criticism can be levied in cultural terms. Turning away from the restricted codes of legal language, in turn, opens access to public discourse on legal ideas, concepts and limits. Through the work of a Berlin-based group called Center for Political Beauty, I explore one way in which art rejects the narrow, state-centered tests for refugee credibility and desirability, offering an alternative vision in which refugees are rearticulated first and foremost as human and welcome. Practicing what they call “aggressive humanism” that marries European commitments to humanity with the kind of tactics usually reserved for demonstrations of military or economic might, CPB participants view their work as “action-art” that ruptures the benevolent, cheerful slumber of the casual supporter of human rights who would rather sign a petition than stage a genuine protest. Their work calls into question the assumption by average European citizens that the state is the guarantor of political and personal privileges, demanding instead the construction of a state which pursues “political beauty” grounded in “exceptional moral quality.” In this approach, acts of political beauty are seen as unique, combining the efficacy of a genuine political solution—not just a response, resolution, or initiative, but a real solution—with the imperatives of beauty, decency, and justice. That which “sounds too beautiful to be true” is the substance of such political beauty. Yet it is through the use of the particular spectacles of mass, tragic death that the CPB seeks to foment such a revolution in European politics. 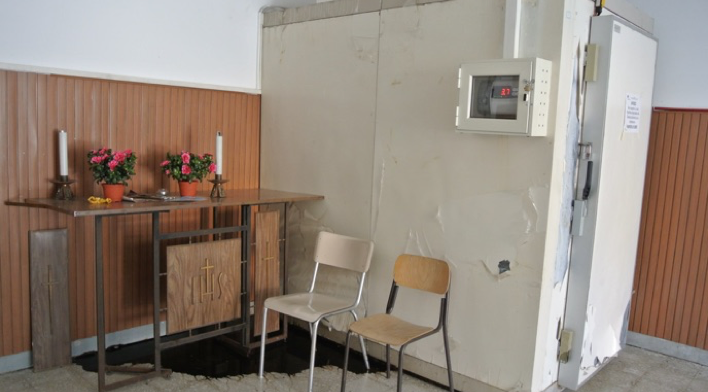 The migrant burial project is entitled “The Dead are Coming.” Many of the drowned migrants are not buried with dignity, but are placed in trash bags, in makeshift warehouses or large refrigerators (such as the one pictured below), or in mass graves by the southern European states that recover their bodies. 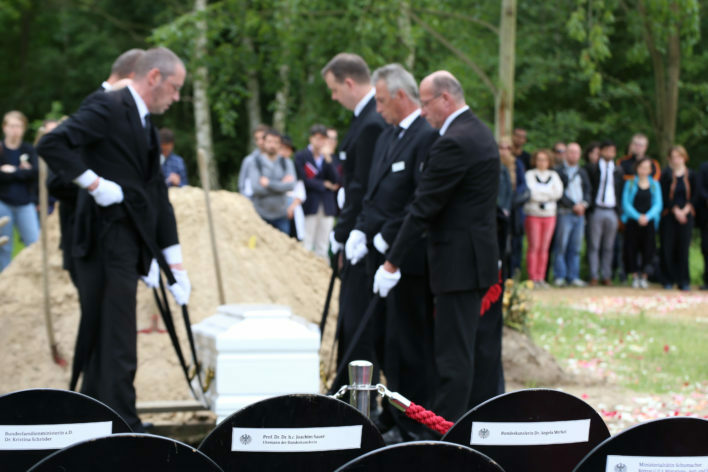 The CPB, working with the Red Cross, attempts to identify these victims and notify their families, followed by exhumation, transportation and finally, a public reburial in Germany. The spectacle of the drowning—traditionally followed by a silent, inhumane mass burial—is inverted with the dignity of performing the individual funeral as spectacle, as these events have attracted mass attendance and press coverage. It is the unexpected nature of these sudden graves that reminds viewers not only of the spectacle of migrant death en route to Europe, but of the nearness of the responsibility for the lack of safe and legal migration routes. Only a small number of re-burials have been completed, and there is some skepticism as to whether the buried coffins contain the actual remains of migrants, as CPB suggests, or if they are merely symbolic, designed to give life to an empty coffin, a face to thousands of dead. 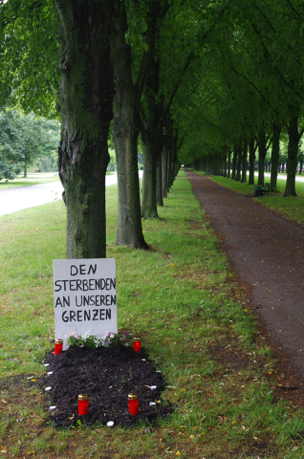 Shortly after the beginning of the campaign—and unrelated to the coordinated CPB movement—many symbolic graves began appearing all across Germany. Hundreds, if not thousands, of such graves now appear across Europe, with documented graves in Switzerland, The Netherlands, Luxembourg, Turkey, Austria, Lithuania, and Lichtenstein. The markers of these graves read, for example, “Borders kill,” “Nameless man,” and “Escaped.” Others are marked only with the geographic coordinates of sites where many have drowned, such as Lampedusa, a small island off the coast of Italy. It is the unexpected nature of these sudden graves that reminds viewers not only of the spectacle of migrant death en route to Europe, but of the nearness of the responsibility for the lack of safe and legal migration routes. These graves can be observed amid the everyday lives of Europeans, while they wait at a bus stop or walk by a park. They serve as a reminder that citizen complicity in state failures has real and deadly consequences. Symbolic graves offer a form of bottom-up resistance to the state and media-driven displacement of responsibility for refugees and migrants’ death onto those making the perilous journey. These graves are quiet, powerful rejoinders to the images of heaving ships with nameless bodies. They remind viewers that each body is a human life and that the needless, politicized loss of each life is its own small, tragic spectacle. During the summer of 2016, CPB erected a Roman-style arena in central Berlin, inside of which were four tigers and a keeper in traditional Roman attire. The group suggested that the arena would host an event in which refugees would be devoured for sport. Designed as a response to an agreement between the EU and Turkey to manage the processing of asylum claims, this art installation highlights the ease with which European states can determine life and death for refugees. Currently, migrants who make the perilous journey outside of legal channels and arrive physically in Germany (or another European state) have a greater likelihood of being granted some form of legal protection, while those who migrate through the official legal channels have a greater likelihood of languishing in a camp or being deported from one of the states on the EU’s external borders. Through this installation, CPB wanted to draw attention to the fact that Germany could choose to facilitate safe and legal crossings for refugees, especially those with family already in Europe, instead of forcing refugees to make a perilous journey by sea. CPB’s performative spectacle suggests that death by tiger could be prevented if the German government agreed to safely transport those who would seek asylum, and commit to such a practice regularly. A deadline was set; if it was missed, the refugees would be devoured. It would be wrong to bring something to a conclusion in the theater that is actually far from over. We will not be part of your logic of killing. We are predators, we kill to feed ourselves and our children, we kill when we face mortal danger… We are cancelling the finale, we are retreating. On behalf of the animals, we leave you alone with your dilemma. We are not the solution; we are the sad performers of your downfall. It is too real to be played. When law decides who is a refugee, it is bound by administrative and conceptual limitations designed to keep the category as narrow and inflexible as possible. This rigidity ensures that states are willing to accept and accommodate any refugees at all. But law is not the only form of collective expression available to citizens of refugee receiving states. When art decides who is a refugee it is unburdened by the law’s bureaucratic and legalized content, enabling it to contest established meanings and assert new understandings. These political and artistic expressions are clearly powerful—but why are individual funerals and graves, or Roman arenas, important to humanizing refugees and encouraging critical reflection on Western legal responses? In what ways does the performance of burial, mourning and grief for the dead migrant indicate a new cultural logic, new forms of social solidarity, and how does it aid in the rearticulation of the refugee? In short, what consequences does a rearticulation of the dead have for the living? When the people of Europe hold funerals or dig representative graves for those who die at their borders, they not only perform a normatively powerful social task by indicating the need for grief or mourning, but they also appropriate and reverse a role traditionally held by the state. Where the state regularly prevents the entry of or deports live bodies, the activities of the CPB and other artist-activists literally and figuratively bring dead bodies in. They make explicit the connection between watching the spectacle of death by drowning unfold in the Mediterranean and the idea of death-as-entertainment in the arena. The performance of the arena, in particular, brings the death sentence that deportation so often carries into the heart of Europe. The decision to deport—and the decision not to intervene in ways that could to prevent migration-related death—becomes a decision to kill and to be entertained by death. It is a powerful frame that helps people to create order, form interpretations and—critically—to resist. Art is one way in which people make sense of current geopolitical events, including the official and administrative aspects that are embodied in law. It is a powerful frame that helps people to create order, form interpretations and—critically—to resist. The importing of the dead refugee body and the spectacle of death as entertainment speak not only to the humanity of the refugee but also have symbolic implications for how citizens must live with refugees. The ability to mourn dead refugees and to see the spectacle of their deaths as out of place in contemporary Europe may have the power to transform Europeans’ cultural response to the living. Art also has the potential to enable a reconceptualization of the law. Current means of refugee recognition rely on a bureaucratized process that cannot grieve. CPB’s works demonstrate that a new conception of the refugee could demand something else: full legal and social inclusion. The works of the CPB and others represent a critique of refugee law that also suggest the potential for a radically different representation of humanity. While artists such as the CPB may not offer practical solutions for refugee law and policy, a symbolic critique may help to set the terms for a new conversation. As the power of outdated legal definitions wanes, the connection between citizen and refugee is being altered through meaningful cultural expression. Events such as the current migration flows into Europe do not become transformative until their meaning is consolidated after the fact, when the symbols and structures they have rearticulated become part of the dominant cultural landscape. It will likely be some time before the full social and legal consequences of the current shifts are fully realized. For now, however, it is apparent that a new collective consciousness has taken root, expressed in part through radical artistic expression, as creative responses to the migration crisis are being imagined and performed. Laws that are incompatible with this shift are likely to face a comprehensive cultural assault on their legitimacy—and refugees will not survive without a renewed legal response. Abigail Stepnitz is a PhD Student in Jurisprudence & Social Policy at UC Berkeley. Her research focuses on law, language, and culture, with a particular emphasis on experiences of refugees and asylum seekers. She is currently affiliated with the Institute for the Study of Societal Issues and teaches in the USF Masters of Migration Studies program.